Cattle producers on NSW’s north coast are being warned about an increase in plant poisonings in livestock. Recent dry conditions are encouraging cattle to seek what appears to be promising green pick, the North Coast Local Land Services District Veterinarian team has warned. “Unfortunately some of the alternatives to pasture are toxic,” District Veterinarian Dr Ian Poe said. Common plant poisonings on the North Coast include bracken fern, red lantana, mother of millions and green cestrum. Oleander poisoning has also been seen in recently. 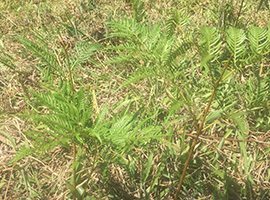 Ian continued, “The signs will depend on the plant eaten but some to watch for Bracken fern include black tarry faeces and pale gums. “Cattle with Red Lantana poisoning have sunburn, may become aggressive and have yellow gums, whereas stock with oleander, mother of millions or green cestrum poisoning die suddenly, often without the owner seeing any signs. “Many producers simply ascribe these deaths to “snakebite”, when in reality it is another problem,” Ian concluded. Source: NSW LLS. For more information contact your veterinarian or the North Coast Local Land Services District Veterinarian team.